What ever happened to the mashup? It seems like it was only a few years ago that we were breathlessly talking about mashing up Flickr photos with Google Maps to create something entirely new. But now when we talk of mashups it's seemingly only to describe music, like DJ Gregg Gillis of Girl Talk whom mixes-and-matches hundreds of pop songs at a staggering rate. The answer, simply enough, is that the mashup has become woven into the fabric of the modern web. Now, instead of talking about mashups, we talk about APIs, apps and cloud computing, all of which are rewiring the internet and have the potential to dramatically change the way brands connect with consumers. 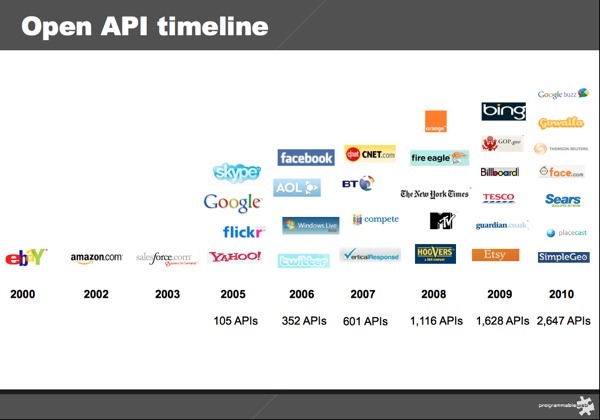 As the API timeline shows, we now list 2,647 APIs in our directory. That dwarfs the 105 from 2005 and even makes the total from 2008 look tiny. Sheer numbers don’t mean much if there isn’t substance within, so let’s look at the most popular types of APIs from the past year. While many of Facebook's 500 million users waste part of their days growing virtual crops or committing imaginary crimes, there are many Facebook applications designed to actually improve business productivity. There are more than 550,000 active applications on the Facebook platform, according to the social network, with many designed specifically to improve business practices or better-integrate Facebook into a company's operations. Many business apps are free. Often, fee-based apps offer a basic service at no charge. Frequently, only limited support, usually via Facebook, is available. In addition to general-purpose business applications, there are apps for specific verticals and jobs such as real estate, education, the entertainment industry, Web design, and marketing. These 15 are worth a look. Accenture also offers a remarkably modest revenue projection for Cloud Computing, stating, "the market for cloud computing is set to grow to US$8.06bn by 2013. The largest component of the overall cloud service market is in implementation, which represented 65 percent (US$1.5bn) of the 2009 market." Accenture foresees opportunities for economies as a whole through "upfront investment demand, including expenditures in design, coding, hosting and so on, followed by the ongoing running and maintenance needs." 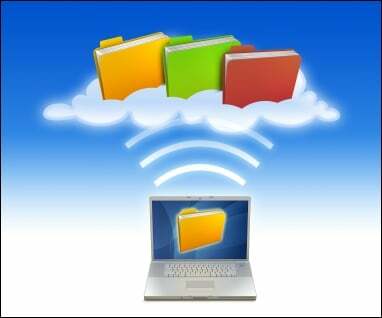 "Cloud computing can (also) open up the digital economy to small and medium sized enterprises," the report continues. "As the fixed costs of IT become variable, more businesses can access computing power over the web and improve their productivity." Bingo again. This is the crux of the matter; IT-driven productivity has saved the US (and other developed nations) many times in the past; through Cloud Computing, it can do it again. Cloud computing is transforming how enterprise networks are architected, where resources such as computing or server capacity, or applications, may reside, enabling enterprises of all sizes to take advantage of economies of scale. The resources an enterprise may draw on from the cloud may be proprietary or open-source or a blend of both. Cloud computing for enterprises is only in its infancy, and there are significant challenges in such areas as security and privacy. But there is no doubt that cloud computing is going to substantially change the way enterprises use IT. You will build a private cloud, and it will fail. And this is a good thing. Let’s start with defining cloud computing. Cloud computing can simply be defined as a computing model in which services (e.g. web based email) and storage (e.g. web hosting) are provided over the Internet. When most small business owners or new software companies talk about cloud computing, they usually mean an application that runs from the web and not directly from your not-connected-to-the-Internet desktop (software as a service or SaaS). Cloud computing software solutions, for our purposes here, mean software that has a low monthly fee rather than a one-time capital expenditure. Just about any business function you can think of has a cloud based solution, from phone services to marketing to operations to finance. It's one thing to say infrastructure and operations (I&O) professionals need to invest in infrastructure-as-a-service (IaaS) cloud computing; it's quite another to justify the financial and resource commitments. This requires a business case that validates the investment on grounds of business empowerment, cost savings, or faster time-to-market. Positive return on investment (ROI) from cloud computing can't be achieved as a blanket business case because the benefits of cloud computing vary based on the application use case. This report examines the case for deploying Web sites onto an IaaS cloud computing environment. Agility is a common cloud advantage, and this translates into faster time-to-resources for application development and operations professionals. But business justification only comes from ensuring the right fit between the applications and the cloud service, and the right IT ops protections and processes. An in-depth look at the latest trends and issues in the space. Cloud computing technologies let us store, access and share all kinds of information over the Internet from anywhere, at any time. Despite its benefits, the cloud is still evolving. For instance, we don't yet have standards for security in the cloud. Here's a look at the latest trends and issues in cloud computing. Google, Microsoft, Amazon and other tech giants are battling for market dominance.